Skin cancer affects one out of every five Americans. If skin cancer is detected and treated early, it is the easiest cancer to cure! Once again, our board-certified dermatologists at Market Street Dermatology, will be conducting free skin-cancer screenings at our office on Monday, May 6th (Melanoma Monday). Our dermatologists can evaluate all of your moles, or can evaluate single spots of concern to you. These screenings are ideal for patients who have spots or concerning moles that have not been evaluated professionally and for patients with no insurance or high-deductible health insurance plans that may be reluctant to seek medical attention. Please be aware that this is a screening only. Spots may be identified that need further attention, but no treatment can be preformed at the time of your visit. We will provide you with a list of board-certified dermatologists in the area for a follow up if needed. This visit is only meant for skin cancer detection. We cannot evaluate acne, hair loss or any other skin rashes at your appointment. Please call our office for any questions or to schedule an appointment at an ideal time for you. 612-746-4144. Walk-ins are welcome too! We are excited to announce that for the month of April, Market Street Dermatology will be offering a special on all of our soft tissue fillers, two for the price of one! Fillers are used to restore volume to the skin and correct the appearance of wrinkles. Our physicians will consult with you to decide the precise location and amount of filler needed. Appointments are limited, so please call our office at 612-746-4144 to schedule. Be kind to your skin: It’s Melanoma Monday! To help raise awareness, Market Street is offering free skin checks today. Walk-ins are welcome. “Melanoma Monday,” is a day devoted to skin cancer awareness. Skin cancer is the most common type of cancer in the United States, and melanoma is the deadliest. It can affect anyone. Though most often diagnosed in men over the age of 50, it’s the leading cause of cancer death in young women aged 25–30. The most common locations for melanoma include the back, shoulders, and the lower extremities—some places can be hard to see on your own. The good news is that melanoma can be highly curable if caught in early. Skin exams performed by a board-certified dermatologist are the easiest way to catch skin cancer early. Make wearing sunscreen a daily habit. Protect your body with sun-protective clothing, hats, and sunglasses. Stay out of tanning beds. Indoor tanning can increase the risk of developing melanoma by as much as 75%. Protect children. Just one blistering sunburn in childhood, doubles one’s chances of developing melanoma later in life. Spring and Summer 2018 will have multiple road closures near our office due to road construction. Please allocate extra travel time in your commute when scheduling appointments. Time flies when you’re having fun. We can hardly believe it’s our 4th anniversary. To celebrate, we will offer 20% off retail products throughout the month of November. The Melanoma Research Foundation invites you to come out to Lake Phalen on Saturday, August 12th, for the Miles for Melanoma Twin Cities 5K run/walk in support to find a cure. If you are unable to attend you are able to participate/donate virtually. Click here for more information. Summer 2017 will have multiple road closures near our office due to road construction. Please allocate extra travel time in your commute when scheduling appointments. Market Street Dermatology wishes everyone a happy weekend! 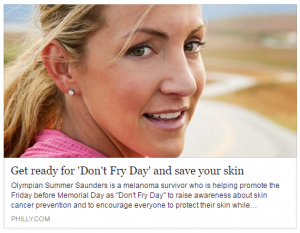 The National Council on Skin Cancer Prevention has declared the Friday before Memorial Day as “Don’t Fry Day”. Enjoy the outdoors, but don’t forget to protect your skin. Be kind to your skin: It’s Melanoma Monday! Monday May 1st is “Melanoma Monday,” a day devoted to melanoma awareness. Skin cancer is the most common form of cancer in the US, and melanoma is the deadliest form. It can affect anyone, including young children. Though most often diagnosed in men over the age of 50, it’s the leading cause of cancer death in young women aged 25–30. It’s common to find melanoma on the back, shoulders, and the back of legs- all places that can be hard to see yourself. The good news is that melanoma can be highly curable if caught in early stages, so if you’re concerned, be sure to make an appointment sooner rather than later. To help raise awareness, Market Street is offering free melanoma checks Monday, May 1st. Walk-ins are welcome, but appointments are recommended to ensure you’re seen promptly. Make sunscreen a daily habit. Protect your body with sun-protective clothing, hat, and sunglasses. Avoid peak rays. Seek shade during the mid-day sun. Stay out of tanning beds. Indoor tanning can increase risk of melanoma up to 75%. Protect children. Just one bad sunburn in childhood doubles a child’s chances of developing melanoma later in life. 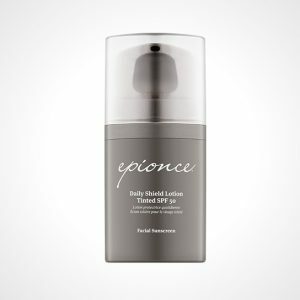 Epionce Daily Shield Lotion will be featured the month of April at Market Street Dermatology for 20% off. This tinted, UV protected lotion is formulated with rich antioxidant and anti-inflammatory properties including zinc oxide, sunflower, and saffron oil. With its sheer, natural looking coverage, this product will have your skin looking and feeling radiantly healthy. Dry, cracked, or peeling lips? Skin Ceuticals Antioxidant Lip Repair can help. This treatment helps retain water to replenish lip tissue, leaving them hydrated and smooth. Market Street Dermatology will be offering 20% off now until Valentines day. Winter air can be very dry and without proper moisture, your skin can become itchy, flaky or crack. The American Academy of Dermatology has some suggestions to help. If you do not find relief from this list, contact your dermatologist for further evaluation. The first day of winter is officially here! With the extreme cold temperatures to come, it is important to protect your skin and stay warm. Here are some helpful tips to prevent frostbite. Market Street Dermatology is proud to be an annual sponsor for the Miles for Melanoma 5k walk/run! If you are interested in raising funds for Melanoma research and education, we encourage you to participate or donate to this event to be held on August 13th at Lake Phalen. Click here for registration details and more information. Market Street Dermatology is pleased to announce that both of our physicians, Dr. Elyse Scheuer and Dr. Lynda Kauls were selected as Top Doctors in Mpls.St.Paul Magazine and Minnesota Monthly for 2016. We are grateful for the recognition from our peers and patients, and will continue to strive for excellence in dermatologic care. Minnesota Monthly just released their list of best doctors in Minneapolis. We are proud to be included on this list along with many wonderful colleagues throughout the metro area. Click to see the full list. Ultherapy® uses ultrasound technology to precisely tighten skin of the face, neck, and chest. It is an award winning treatment with no downtime and natural results, you can learn more at ultratherapy.com. If you pick up a copy of Mpls.St.Paul Magazine, you will see both Dr. Lynda Kauls and Dr. Elyse Scheuer have been recognized as Top Doctors for 2015. We feel it is a privilege to care for patients and we are delighted to have both of our doctors honored in this way. Learn more about Melanoma Monday® at aad.org. We will be participating by offering free skin cancer screenings all day—please call the office for more information at 612.746.4144.